VERSATILE & DEPENDABLE: 1 x 3.5 inch & 1 x 7 inch extensions included, accommodate openings of 28 - 42.5 inch wide, extra tall height of 39.5 inch. Additonal extensions sold separately, can be extended up to 188 inch. Dreambaby Gate Adaptor Panel (42 inch tall) provides a flat surface to install child safety gates. It is very universal and can be used with most any brand hardware or pressure mounted gates. It is suitable for top and bottom of stairs and fits most stair posts and banisters. This gate adaptor is quick and easy to fit requiring no tools or drilling. Provides a flat paintable surface. Chelsea Xtra-Tall Auto-Close Security Gate - White The Dreambaby Chelsea Xtra Tall Auto Close Metal Security Gate combines safety and convenience in one fantastic package. Great for every home, this pressure-mounted gate is easy to install and is perfect for temporary or rental properties with no screws or drilling required. Designed by parents, for parents, the Chelsea gate allows for one-handed operation, a door that opens in both directions and closes automatically from any distance, every time. For added security, the EZY-Check indicator shows the gate is securely locked with just a quick glance and the double action locking feature helps keep even the most curious toddlers at bay. Smart Stay-Open feature is perfect for when you need to move freely through the gate, such as when you're carrying groceries or clearing the table. Just swing the door in the stay-open position and it will stay wide open until you choose to close it. 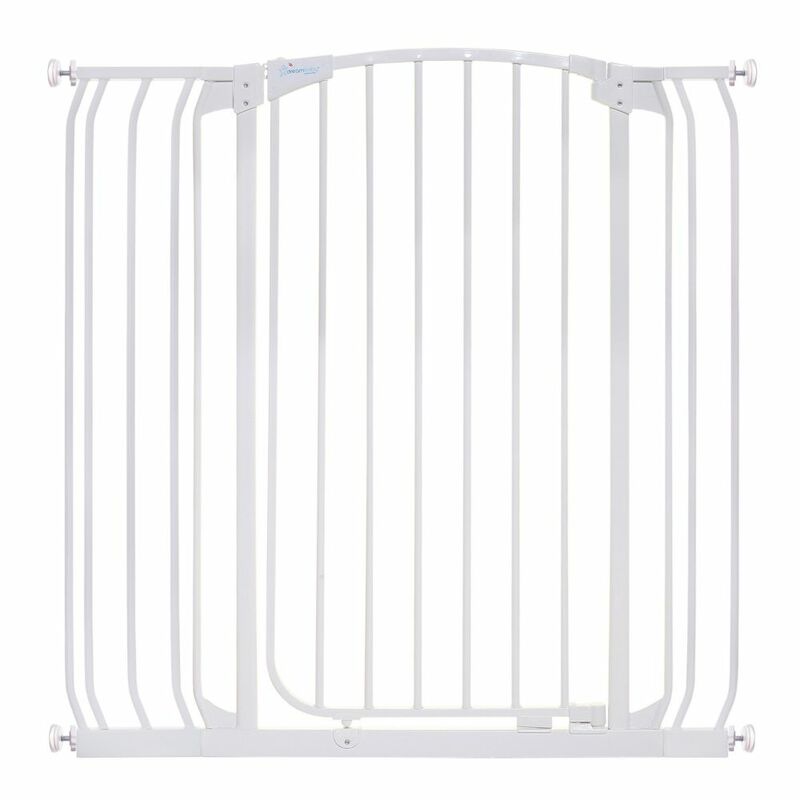 Chelsea Xtra-Tall Auto-Close Security Gate - White is rated 4.8 out of 5 by 34. Rated 5 out of 5 by Radish from I bought two sets of metal gates a couple of weeks ago to keep my dogs in designated areas of my ... I bought two sets of metal gates a couple of weeks ago to keep my dogs in designated areas of my home. I installed them in two hallways that have different opening widths. They are easy to install, sturdy and they work well in keeping my two dogs in confined areas, one weighs 65 lb, the other almost 13 lbs. These products are well designed, simple to operate, and sturdy/heavy enough to withstand the daily non-stop opening and closing operations. I am very pleased with them. Rated 5 out of 5 by William from The Dreambaby gate was easy to install, works great and... The Dreambaby gate was easy to install, works great and looks great! Rated 5 out of 5 by Sequimbuyer from Worked perfectly for my needs. Keeps my cat out of the house where I don't want her and will work... Worked perfectly for my needs. Keeps my cat out of the house where I don't want her and will work great for a puppy I will be bringing home soon. Not hard to install. Rated 5 out of 5 by Joanne from Works really well Bought this gate to keep our dogs out of the house. They are jumpers so the height works well to keep them in the extension. Fits nicely in the doorway and we adjusted it fit perfectly. The door locks well and we've had no issues with the since we installed it a few months ago. Rated 5 out of 5 by FrenchyFL from We like it! We bought 2 for the stairs with... We like it! We bought 2 for the stairs with extentions.. it s pretty strong, easy to open for an adult but not so much for a 3 yo which is totally what i was looking for! It s tall which is perfect so my oldest cannot climb either! Very happy with the product! Rated 5 out of 5 by Patti from Great gate. Opens in and out. Tall enough... Great gate. Opens in and out. Tall enough to keep dogs from jumping over. Easy to put up and quite sturdy. Rated 5 out of 5 by June from I acquired a Siberian Husky puppy in the fall. Went... I acquired a Siberian Husky puppy in the fall. Went through many gates. This gate is AMAZING! Sturdy, strong, and keeps her contained to the kitchen and living room areas. You will not be disappointed if purchased! Rated 2 out of 5 by Jennifer from This is a pretty gate. It is difficult to open,... This is a pretty gate. It is difficult to open, however. My mother-in-law has great difficulty opening it. Would b great if latch was improved. I have had this gate less than 2 weeks, and it is now already broken, and it has lost its auto-close feature. Very disappointing.